to ensure their safety during each school day. This duty extends to when the students are participating in extra-curricular school activities such as school sports. Colbrow Medics provides immediate medical attention and first aid response to students when participating in school sporting events and carnivals. Colbrow Medics provides teachers, parents and students with peace of mind, knowing that if an injury occurs, immediate medical attention is on hand to ensure that the risk of further harm to the injured person is minimised. A dedicated First Aid Team on hand at school carnivals and sporting events relieves the first aid responder burden from parents and teachers and allows for a professional and calm response to situations where students might sustain injuries. Colbrow Medics (First Aid @ Events) provides onsite medical attention and event first aid response to students when participating at school sporting events. Colbrow Medics provides teachers, parents and students with peace of mind, knowing that if an injury occurs, immediate first aid and paramedical attention is on hand to ensure that the risk of further harm to the injured student is minimised. Colbrow Medics can allocate First Aid Officers to school sporting events as well as fetes, camps, performances, arts events, open days and expo nights. Colbrow Medics has the appropriate medical personnel for any event, including school camps and international tours. We can provide Registered Nurses, Paramedics or First Aid Medics to any multi-day event, providing 24 hour medical assistance. All medical equipment can be provided including, trauma first aid kit, asthma and anaphylaxis management supplies (sulbutamol & epipens) as well as a defibrillator. Our Medics can also be of assistance to the school staff as required. Colbrow Medics will ensure complete peace of mind at all times. Colbrow Medics can provide relief nursing staff for your school sick bay. Our Registered Nurses or other qualified medical personnel, hold the experience and qualifications to ensure your school does not go uncovered. Whether covering for sick leave with as little as an hour’s notice, or planned leave, Colbrow can assist. In this age of litigation, it is insufficient to have a parent or teacher trained in first aid on hand at school organised events. A parent or teacher cannot be guaranteed to remain calm and assess the situation professionally, especially where the injury might be to that parent’s child or that teacher’s pupil. Our qualified health professionals include Medical Doctors, Registered Nurses, Paramedics, St. John Ambulance and Red Cross trained First Aid Medics who can be on stand-by to provide you with peace of mind and ensure the safety of your students. 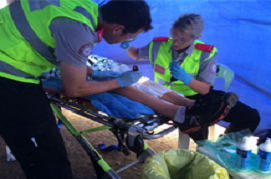 Colbrow Medics can help with your first aid requirements relating to any school event, function, sports carnival or school camp anywhere throughout Australia and internationally.